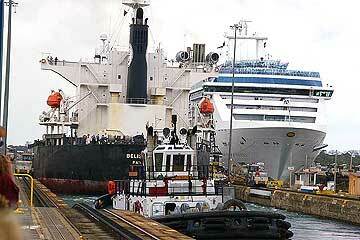 Cruise ship in the Gatun Locks near Colon, Panama. Cruise Addicts - News, links and reviews of cruise lines. Cruise Diva - Tips, locations, reviews and cruise industry news. Cruise Report - Reviews and Information. Cruise Reports - Reviews, news and links. Cruise Reviews - User submitted reviews of cruises and general cruise information. Cruise Tip Calculator - Offers suggested tip amounts for several cruise lines, then calculates the total amount of your tip, based on number of people and length of cruise. Provides the total number of bills of each denomination you need to fill all your tipping envelopes. Cruise Watch - Vancouver - Focus on Vancouver and cruises to Alaska as well as other destinations. Cruise-Reviews.com - Cruise information and public reviews, photo gallery and forums. CruiseStateroom.com - Database of stateroom amenities aboard cruise ships. Deck plans for most major lines. Epinions.com: Cruises - Advice and opinions written by consumers. How Cruises Work - Links and answers to common questions about cruising. 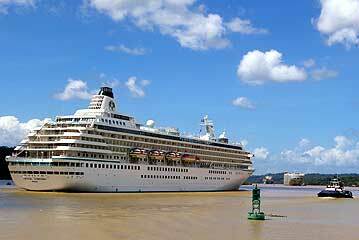 Ocean Cruises - Directory of cruise lines and articles on cruising. Search2Cruise - Directory of cruise itineraries searchable by name or location.